White Boy Rick is one of those movies that doesn’t quite work. It has a decent cast and potentially outrageous story, but makes the crucial mistake of playing the material seriously rather than off the wall. In the right hands, this could have been an outrageously fun movie that was able to tackle mature themes of family dysfunction, social unrest in 1980’s Detroit, and political corruption. Unfortunately, what we get is a slow, largely aimless movie whose scenes feel more like a “Greatest Hits” album of points in the life of its title character rather than a realistic story. Worse still, Matthew McConaughey is somehow taking this blasé material and running with it, leaving his co-stars in the dust and hinting at how fun the film could be. Alas, White Boy Rick is a clichéd, underwritten mess with a lot of good ideas, but no way to explore them. 14-year-old Ricky Warshe (Newcomer Richie Merritt) lives in 1984 Detroit with his criminal father of the same name (An admirably dedicated Matthew McConaughey). With his mother nowhere to be found and his drug-addict sister Dawn (Bel Powley) leaving the family for her abusive boyfriend, Ricky’s life has no purpose. That is, until two FBI agents (Jennifer Jason Leigh and Rory Cochrane) coerce him into being their informant, threatening his father’s imprisonment if he refuses. This sends Rick down a rabbit hole of drugs, violence, and political corruption that will alter him and his family forever. White Boy Rick had so much potential. Matthew McConaughey is solid as a charming scumbag and Powley makes a good impression as Rick’s sister, but the film moves too quickly for us to care about anyone, yet feels overlong due to awkwardly slow dialogue delivery and a lack of momentum. It is possible to have an informative biopic and an entertaining movie at the same time (See Marshall for proof), but this movie fails at both. Finally, the narrative is so busy jumping from its largely unrelated plot threads that none of them have time to develop or resonate with the audience. Everything is in place for a fun and thought-provoking story, but its maudlin execution prevents it from greatness. White Boy Rick could have been a darkly comedic crime drama, but is weighed down by snail-like pacing, a brutally downbeat tone, and laundry list of disconnected plot elements. Matthew McConaughey seems to be the only one aware of how outrageous this story is and has some brilliant one-liners, but he doesn’t fit with the rest of the movie and made me realize how good it could have been. 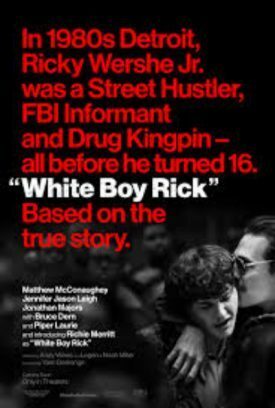 White Boy Rick may have been a great mole, but his movie proves some stories are better off left in the history books. Skip it.